The Hug the world tour continues and, with enormous pleasure Verbal Aikido returns to the States Oct 20th to November 23rd 2018. An in-depth testimonial video is in the making, here’s just a taster from our first destination… Melbourne! After our events in Australia, Singapore, the UK and France, we’re now about to embark on the American leg of the tour. Many have shared about their experience with VA, so let’s continue the sharing! Our first stop off is in Texas at the Sam Houston State University for a week of events including “Free listening” and “Roast me!” activities on the campus as part of Conflict Resolution Month with SHSU on Wednesday October 24th. Come check us out! Then on to California and other west-coast pastures, for more fun and encounters! You think there’s an opportunity to meet on our trails? Let us know. Flyer-2018.2019-EN-US-Letter.pdf	(88 downloads) More info on the Hug Site. You may be surprised to know that the Verbal Aikido approach is a worldwide movement that has existed for a very long time, in some form or another. Since I first touched on it myself in 2009 I quickly realized the presence of a collective consciousness that had brought it into existence. Indeed, as with many of these blog posts, the following article is a response to an oft-asked question. 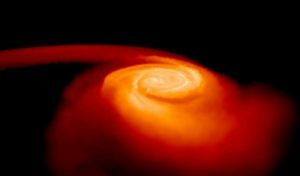 Where does it all come from? Well the short answer is Morihei Ueshiba. The “Great Teacher” named his approach officially “Aikido” in 1942 and continued to develop it throughout his life, not only on a physical level but very deeply in its philosophical aspects too. Although Ueshiba did not coin the term “Verbal Aikido”, it was clearly part of his vision for interaction on all levels, verbal, emotional, physical etc. Where do I fit into it all? Well, almost 10 years ago I started an institute to help teachers develop their skills to become more effective in the classroom. About a year later, one of my clients (a para-medical school) asked me if I could help their teachers manage agressive and disrespectful students. With my experience in martial aikido and my great love for the philosophy I immediately felt that some form of “Verbal Aikido” would be a perfect solution. I was initially buzzing with the idea that I had “invented” something, but within about 15 seconds Google had curbed my enthusiastic discovery euphoria – there was already a few people who had made reference to it (at the time the most extensive work on it was Kyle and Pace Smith who had written a chapter on it in their book “The Usual Error”, inspired by Terry Dobson’s work). This was in fact quite reassuring… indeed, it meant that there were already many people out there on a similar wavelength, and after reaching out to everyone who had referenced Verbal Aikido at the time, I was greatly encouraged by all that responded. Where I was able to contribute to this art was of course through my speciality – how to teach it: how to make it enjoyable, dynamic and easy-to-learn. Which is where the “Dora-esque” Three Steps come from! Suffice to say that, according to the founder – the changing of technique over time is the essential nature of Aikido – and I have been blessed with opportunities to adapt and develop the Verbal Aikido approach continually since its creation. Whether its with high-school students, multinational CEOs, doctors, nurses, teachers or 5-year olds, the form that the learning takes can and does change considerably, yet the substance remains the same. Check out our FAQ page for an interview on this topic. We’re often harder on ourselves that we are with others, but is it possible to interrupt our internal criticism, and maybe even to transform it into a more beneficial internal communication? From where does this inner critic hail, refusing to speak to you as would a true friend? Well, you may find an answer to this question in therapy, but your ability to change the voice and how it expresses itself is a matter that Verbal Aikido manages with astounding efficiency. What would happen if you were able to get that voice to recognize other ways of talking to you that would be much more beneficial? How you would feel if, when things are not going as you wish, instead of hearing “How dumb are you? !” (or other criticisms) your inner voice began to speak to you as would a friend who reassures or supports you? Finally, what would this new voice sound like… what would they be saying to you? You may already know that, when we get verbally attacked by another person, the practice of Verbal Aikido gives us the ability to orient the vast majority of exchanges toward a balanced and constructive outcome. For the rest, we manage to significantly decrease the level of aggression in the exchange and to change the dynamics of the relationship for the better. That said, we cannot under any circumstances force the other to accept the Ai-ki that is proposed – indeed we simply propose Ai-ki, and after three of these propositions, we can withdraw in good conscience. 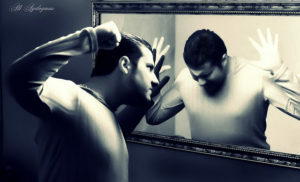 The good news is that with an internal criticism or attack, we can force ourselves to accept what we propose in Ai-ki! Obviously there is no magic formula; it is our intention, practice and repetition (come and practice in our workshops!) that develop our capacity to interrupt and “reprogram” our inner voice. Until that day comes when we’ve lost our keys and we hear someone reassuring us with soothing and encouraging words, and we realize that it is our own voice speaking to us… as would a friend. One thing is certain is that we are stuck with ourselves until the end of our days… isn’t it just better if we’re able to get along! You may well be smiling if you recognize this technique as the Meaning Prod, but truly this question – “What does your belt mean for you?” – is an extremely beneficial starting point when discussing any such abstract or symbolic concept as belts, degrees, titles, and so on. When you listen to how each individual expresses the meaning they put behind these ideas, you’ll find such a wide variety of answers that may make you wonder if they’re even talking about the same things at all! You might even go so far as to start seeing the merits of doing away with the use of belts entirely. One could even ask: why differentiate between green and orange, or even white and black? No matter what your answer to this question is, it’s rooted (deeply or not) in your belief system. However common or rare you think your answer is, it’s just the tip of the iceberg in understanding what your belt actually means to you. it gives you a sense of pride, doubt, or is linked to your self-esteem in any way. 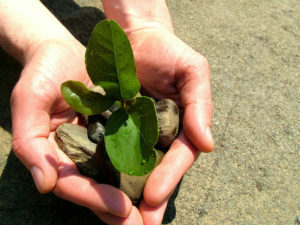 The path towards Green Belt: the intention to discover and use effectively the basic steps in the art. The path towards Blue Belt: the intention to include emotional recognition in the practice of the basic steps. The path towards Orange Belt: the intention to develop and deepen an understanding of the dynamics in verbal conflict and reconciliation, both internal and external, and to appropriate the art (i.e. make it one’s own). The path towards Blue Belt: the intention to overcome one’s “dragon” and deepen one’s practice in situations with strong sentimental attachment. The path towards White Belt: the intention to increase facilitation, guidance and accompaniment skills, by transmitting to and learning from learners. Even though most learners prefer an external validation at some stage (i.e. 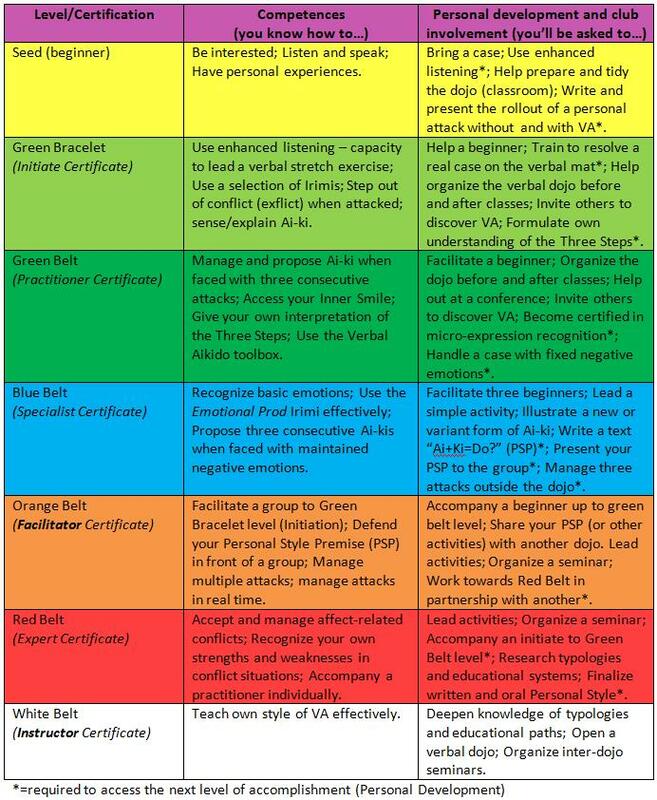 a more experienced person who can corroborate their capacities), one can indeed be a self-proclaimed green, blue, orange, red or white belt if it seems appropriate! Why not? After all, your belt has the significance that you give to it, and your understanding of each aspect will be evolving constantly throughout the learning experiences that your life presents to you. I remember being told that as soon as you’ve had one class of aikido, you should start to teach someone else what you’ve learned. Indeed this is also true of Verbal Aikido, and the very act of sharing any newly acquired knowledge has the benefit of reinforcing your own understanding of what you have learned, or at the very least, helping you see what is missing from your understanding. The specificity of following a path to White Belt is that there is a clear intention to accompany an individual, or group of individuals long-term to their goals. … you might just be on all five paths simultaneously, or a motorway, if you prefer. So whatever your path, however wide or winding it may be, it’s now time to tighten that knot and get practicing! It’s the intention that counts, and it starts with just one word. 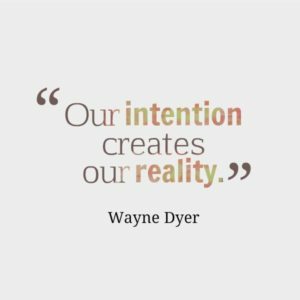 So what was your intention today? What do you mean you didn’t even think of it!?!? OK well I guess it’s fine for now, but by the end of this article you’ll have every reason to sense to the power of your intention, and feel it every single day! 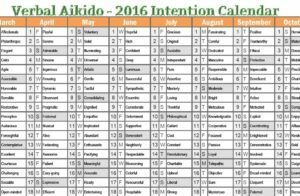 As mentioned in a previous post about daily intention exercises (Davies), working on your deliberate intention is a key factor in your success with Verbal Aikido. Being able to implement and hold your intention faced with an attack not ony puts you a step ahead of your partner, but gives a higher level of mastery in the overall exchange. I would even go so far as to say that the more you work on your own intentions, the more other people’s intentions (or lack thereof) become clearer too. Just call it a bonus effect! “Yeah but, how can I really work on my intentions?” – It’s easy enough, just choose a constructive direction you’d like to develop with your actions throughout your day. “Yeah but what if don’t have any ideas for a daily intention?” – Ahhh, well now you’ve presented me with an opportunity to give you a present! Click here to download your brand new 2016 Intentions Calendar, suggesting a word a day. That’s 366 ideas to enhance your daily actions and develop your power of deliberate intention. What are you waiting for! I must admit, personally I do like to have a morning reminder to help me as I’m sipping on my coffee. 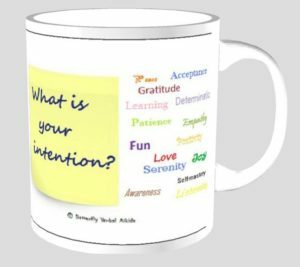 If you too would like to have one of these helpful mugs, and set yourself on the right tracks first thing in the morning… just let me know! There’s more than one reason you won’t find Aikido at the Olympic Games, but essentially an activity that produces no winner is an unlikely choice if you’re expecting an exciting climax. It’s quite easy to understand why most people believe that having a winner inevitably implies the existence of a loser, after all, it’s what we see all around us; in sports, politics, talent shows, lotteries… the list is endless. But what if there were other ways to perceive these processes? What if seeing things as “right or wrong”, “win or lose” was just a first step in our understanding? To prepare your movement away from this dualistic view, I encourage you strongly to explore your own beliefs on these notions and, if you can find a willing partner, stretch these words (right, wrong, success, failure, etc.) to develop a greater understanding both of yourself and the limiting subjectivity that surrounds them. 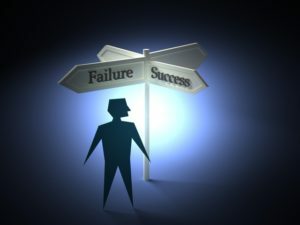 The next time you’re somewhere and you wonder “should I stay or should I go”, take a moment to explore other alternatives that may be available… I guarantee you’ll find at least one more, and that in considering these other options, making your choice will seem more evident and often considerably easier. Finally, you may be already familiar with O-Sensei’s teaching “Masakatsu Agatsu” – True victory is victory over oneself – but did you know he is reputed never to have lost an argument? Indeed this doesn’t mean that he ever won one either! But rest assured, there are many ways you can win on a personal level without producing a loss. The most fundamental of these is to remain centered when faced with adversity. But don’t get discouraged, because the experienced practitioners also lose their center regularly, get destabilized and even fall. So another form of self-victory might then be your capacity to return to center as quickly as possible… How many other types of self-victory can you find before the end of the day? If ideas are not yet coming to you by the shipload, this may set you off in a helpful direction: there is a Chinese proverb that says “If I have one object and you have one object, and now we exchange objects, we both still have one object. But if I have one idea and you have one idea and now we exchange ideas, we both have two ideas.” So, if your objective in an exchange is to discover something rather than to convince or show what you know, then you will walk away from any interaction richer than before. There’ll be no ‘loser’ in sight, yet… you’ll ‘win’.